Dungeon Loots ist ein Addon, welches Ihnen die Bossdrops eines Instanzbosses zeigt. einfaches Interface zum graden und plussen eines Items. Dungeon Loots is an Addon, which shows you the drops of a instance Boss. Les versions V3.1.2792-hotfix & 3.1.2792-fix2 ne fonctionnent pas. Une seule interface vide s'affiche. Est-il possible de rectifier cela ? Can you please check your interface error messages? (The red button next to the minimap). Hi, i have the same problem, addon doesn't work. armor and weapon table mostly contain an id of the treasure table (100%). the game looks which table is chosen and gives you one of the ids. if the link is from armor/weapon to treasure it's always a stat (except of sometimes broken because of rw). this droprates are affected by the leveldifference between player and enemy. If you use dropstuff, these droprates increase. You can get ALL of the drops listed in there. Because each drop is calculated on it's own. I don't know if there is any impact of luck stuff in dura or rune slots. I find the listed drop rates very interesting, and would like to know where you got this information, and what else you might know about drop table calculations. 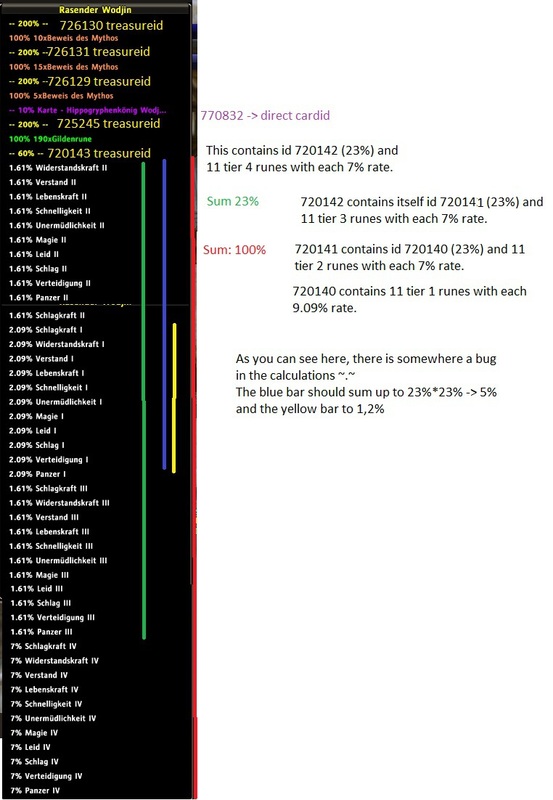 It would seem as if all of the listed yellow % are the chance that one of the items from the table below it will be dropped. Many of the % on these tables add up to 100%, which is to be expected, but many others add up to significantly more than that, which is strange. Many of the potion tables, for example, add up to something in the area of 250%. Why is that? Do you know how drop rate boosts (runes, luck potions, etc) interact with these? My presumption is that the chance of each individual drop table is increased (multiplicitavely) by the % of the boost, to a cap that prevents 100% and higher tables from being increased for multiple boss drops. Does that sound about right? Furthermore, I don't know if drop rate boosts have any impact on the random qualities of weapons/armor (durability, stats, rune slots), but if you could shine any light on that, it would be appreciated.